Taking risks when getting dressed is always a little scary, but with a little guidance and the willingness to try different things out, little by little the fear will dissipate. I had always kept my workout wardrobe quite simple (and mostly black) to make things easier and quicker when getting dressed. I never wanted to think about it or put any effort into putting together a workout outfit, but now that I am spending most of my time in workout clothes, I have started to have more fun with it. There are a few different things you can play with when feeling adventurous with your outfits, like color, texture, print, and pattern. Try to mix different patterns in the same color family, keeping it within the same colors will give you a pop without making things too crazy! This first outfit is mostly black and white (which can be ‘boring’), but by mixing stripes and a fun print you can really spice up the black and white combo. I personally love a good striped pair of tights, and I like to explore with fun different shapes for my tops. Maybe think about tops that are backless, or with an open back or sheer back. Don’t be afraid to mix more than one print or pattern in one outfit. You can break them up by mixing in some solid pieces, and by not putting them right next to each other. It also depends on your proportions. If you are more pear shaped, you may want to use a vertical print on your pants and horizontal stripes on your sports bra, or reverse the print/pattern if you have more of a boyish figure. I also like wearing a patterned/printed bra that peeks out on the side or back, so I don’t feel like I am printed all over! I particularly love these Gap Cityscape leggings — even though they’re bold, they are black and white, so they are a little easier to pair with either a pattern and/or a color. I always love wearing one bold piece with either a print or pattern, and then keeping everything else solid but adding a bright color somewhere in your outfit. If you stick to neutral prints (which is mostly my case), then adding a bold color can be fun. (I really like to get shoes with small color accents that I can play with.) 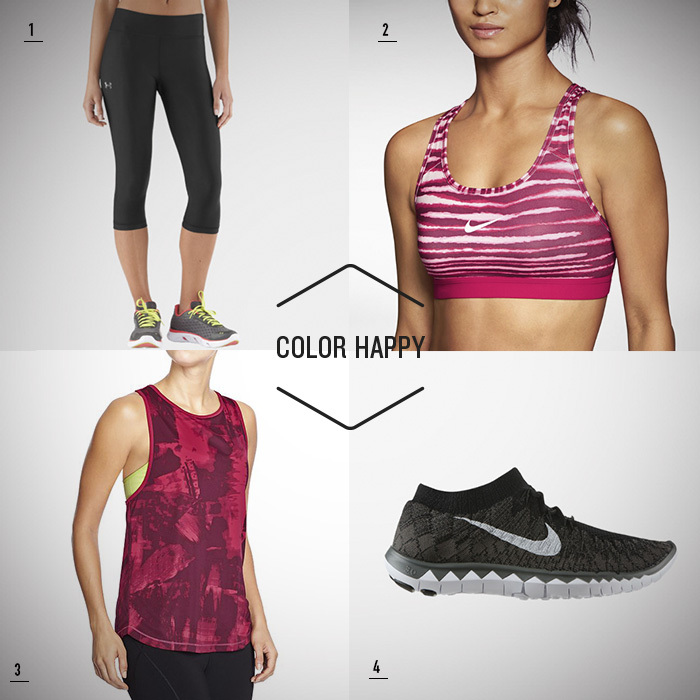 If I choose a colorful print, I tend to pick a non-predominant color in it and accentuate it with a sports bra or top. If you are feeling REALLY adventurous and bold, you can wear every single piece with a print. In order to accomplish this successfully, try and keep it to neutral colors, and try to stay within two to three colors. 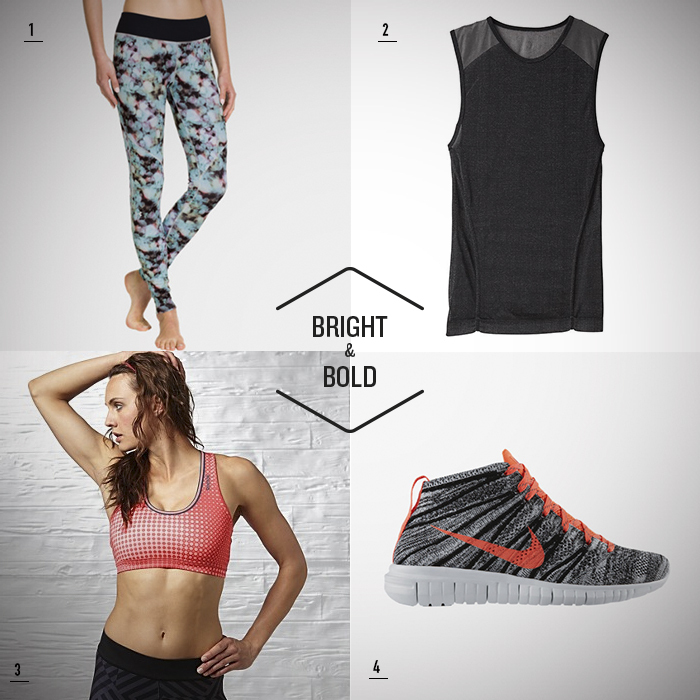 Smaller prints/patterns are easier on the eye, and monochromatic colors are also easier to pair. The pieces here are a great example of how you can mix stripes with dots with more stripes and smaller dotted prints. I haven’t always been a big fan of color, but I’ve grown out of my habits by stepping out of my comfort zone one step at time. If you’re afraid of color, start introducing it into your wardrobe in small doses. If you like color but tend to go for softer shades, maybe try and go for bolder/brighter tones. And if you’re not afraid of color, then just have a little more fun with it and try mixing more colors in, or adding textures, prints, or patterns. It is all about the small steps that eventually lead to big changes! Start with whatever scares you the least… Maybe it’s trying a different shape, or adding more color, or a print in neutral colors? You just have to take that first step and start somewhere, right? Born and raised in Venezuela, Natalia Millan moved to New York for school, working in retail as she finished her degree in finance. She stayed in fashion for ten years, both in stores and corporate planning and merchandising, and has always loved fashion and expressing herself through it. At the start of 2014 and already addicted to Soulcycle, Natalia decided to change paths and become a full-time Soulcycle instructor, a change that has been both humbling and rewarding.